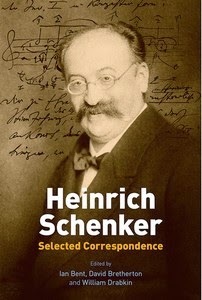 Heinrich Schenker: Selected Correspondence, ed. Ian Bent, David Bretherton, and Willliam Drabkin (Boydell Press, 2014), is the product of a long-established Schenker documentation project and comprises an extensively annotated selection of letters written by or to Schenker, with linking passages from his diaries. The cast of characters includes household names from the world of musicology (Guido Adler, Otto Erich Deutsch, Alfred Einstein, Anthony van Hoboken), as well as publishers, performers (e.g., Eugen d'Albert, Wilhelm Furtwängler, Paul von Klenau), composers (Busoni, Schoenberg, Hindemith), educators (J. P. Dunn), pupils (Hans Weisse, F.-E. von Cube), and friends. Many of the letters have not yet appeared in Schenker Documents Online; they reveal further aspects of Schenker's multi-faceted career, his place in the Viennese musical world, and the influence he exerted in his lifetime in Austria, Germany, and further afield. The 450 letters offered here, an extension of the scholarship that has gone into SDO, are published in English; they have been translated and annotated by a team of twelve scholars based in the UK, the USA, Austria, and Germany. They are presented by topic and theme, in a broadly chronological arrangement, with a substantial historical preface and introduction. The volume is thoroughly indexed by name and subject. Its 544 pages of text are supplemented by 16 pages of plates, which give sample images of handwriting, drawings and photographs of correspondents, cartoons, and a title-page from one of Schenker¹s published compositions. The book will be on display at the joint annual meetings of the American Musicological Society and the Society for Music Theory in Milwaukee in November. A book launch in London is also envisaged. William Drabkin is Professor of Music, emeritus, at the University of Southampton. Webpage HERE.